The Mystery of Being contains the most systematic exposition of the philosophical thought of Gabriel Marcel, a convert to Catholicism and the most distinguished twentieth-century exponent of Christian existentialism. Its two volumes are the Gifford lectures which Marcel delivered in Aberdeen, Scotland, in 1949 and 1950. Marcel's work fundamentally challenges most of the major positions of the atheistic existentialists (Sartre, Beauvoir, Camus), especially their belief in an absurd, meaningless, godless universe. 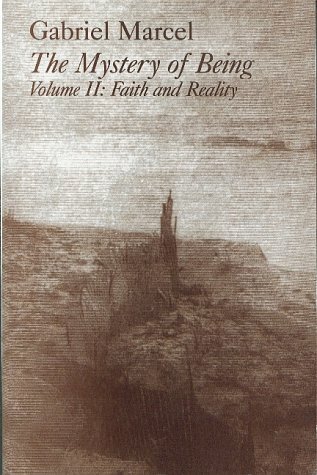 These volumes deal with almost all of the major themes of Marcel's thought: the nature of philosophy, our broken world, man's deep ontological need for being, i.e., for permanent eternal values, our incarnate bodily existence, primary and secondary reflection, participation, being in situation, the identity of the human self, intersubjectivity, mystery and problem, faith, hope, and the reality of God, and immortality.